A sniper serving life in prison for terrorizing the Washington, D.C., region as a teenager must get new sentencing hearings in Virginia, a federal appeals court ruled Thursday. RICHMOND, Va. (AP) — A sniper serving life in prison for terrorizing the Washington, D.C., region as a teenager must get new sentencing hearings in Virginia, a federal appeals court ruled Thursday. The 3-0 decision by the 4th U.S. Circuit Court of Appeals denies an appeal by prosecutors who said they already complied with the requirements of the U.S. Supreme Court, which found in a series of rulings after Malvo was sentenced that mandatory life-without-parole sentences for juveniles are unconstitutional. 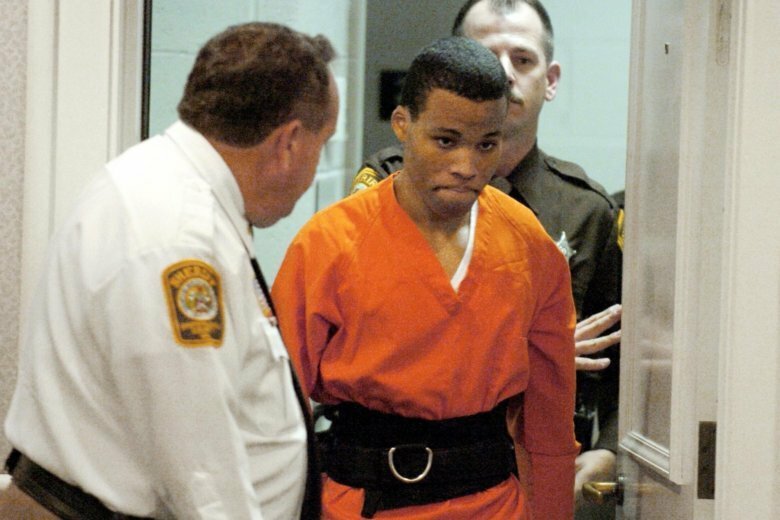 Lee Boyd Malvo was 17 when he and his mentor, John Allen Muhammad, fatally shot 10 people they targeted at random in Virginia, Maryland and Washington in 2002. Muhammad was sentenced to death and executed in Virginia in 2009. Malvo received multiple life-without-parole sentences in Virginia and Maryland. The 4th Circuit found Malvo’s Virginia sentences must be vacated, upholding the decision of a lower court judge. Thursday’s ruling applies only to Malvo’s four life sentences in Virginia. A Maryland judge denied new sentencing hearings last year for Malvo in those cases. The appeals panel found that the Supreme Court’s new rules for sentencing juveniles, which must be applied retroactively , were not satisfied when Malvo was sentenced years earlier. Malvo’s resentencing judge must now determine whether his crimes show he’s permanently incorrigible, and thus can be sentenced to life without parole; or that they reflect “the transient immaturity of youth,” and merit a lesser sentence. “To be clear, the crimes committed by Malvo and John Muhammad were the most heinous, random acts of premeditated violence conceivable, destroying lives and families and terrorizing the entire Washington, D.C. metropolitan area for over six weeks, instilling mortal fear daily in the citizens of that community,” Judge Paul Niemeyer wrote. The brother of one of Malvo’s victims said even the remote possibility of Malvo being back on the street someday is unsettling. “Is it fair that he gets out when there certainly was a permanent sentence for his victims — not just one victim, but so many victims?” said Bob Meyers, whose brother, Dean, was fatally shot while fueling his car at a gas station in northern Virginia. Malvo’s attorney, Craig Cooley, did not immediately respond to a request for comment. During oral arguments January, Deputy Solicitor General Matthew McGuire argued that the trial judge’s actions conformed with subsequent Supreme Court rulings because he had the discretion to reduce the jury’s recommendation of life without parole, but chose not to do so. Cooley countered that the judge’s actions did not conform, because he gave jurors only two choices: life without parole or the death penalty. Virginia Attorney General Mark Herring had pursued this appeal. His spokeswoman Charlotte Gomer said Thursday that he is considering all options, which could include asking for a full 4th Circuit rehearing, or asking the U.S. Supreme Court to hear the case. “We are going to review the decision closely and decide how best to proceed in a way that ensures this convicted mass murderer faces justice for his heinous crimes,” Gomer said. Malvo’s attorneys, meanwhile, are appealing a judge’s denial of new sentencing hearings in Maryland.